FANBOY PLANET.com . : symphony-silicon-valley-LOTR :. It turns out that with a big enough fellowship, apparently one can simply walk into Mordor. 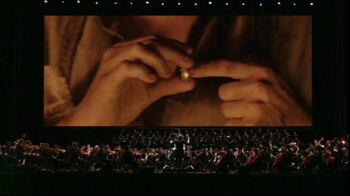 Or at least, we can get that same feeling with a live symphonic orchestra playing alongside The Lord of the Rings. Recreating Howard Shore's beautiful and haunting score for Peter Jackson's epic trilogy, Symphony Silicon Valley will be performing underneath screenings of the films in the trilogy at the beautiful California Theater in downtown San Jose. The California Theater is less than two blocks away, with plenty of fine dining in and around the route. That includes Cafe Stritch, from where we have occasionally done the Fanboy Planet podcast. 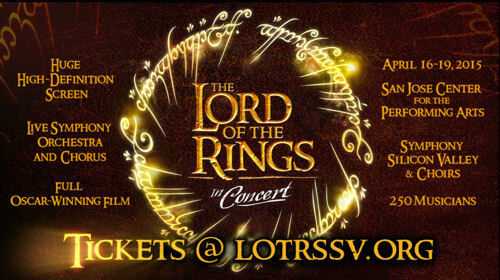 Tickets and more information are available here, at lotrssv.org.